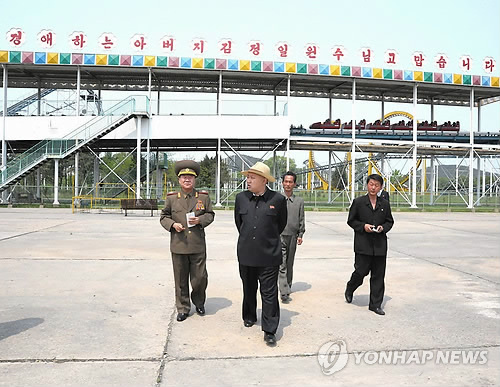 DPRK state media reported on 9 May (Wednesday) that Kim Jong Un (Kim Cho’ng-u’n) visited Mangyo’ngdae Fun Fair (amusement park). The amusement park has occasionally been featured in tourist photographs. 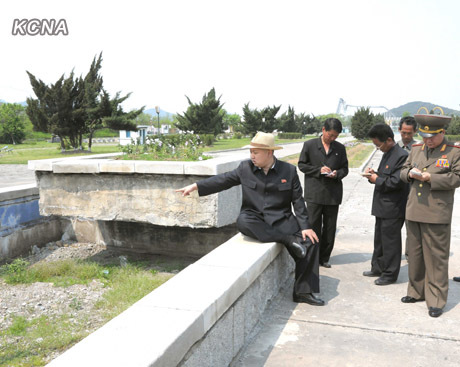 Some images have shown DPRK citizens using the park, however other pictures have shown the areas of the park, constructed in the 1980s, shuttered. 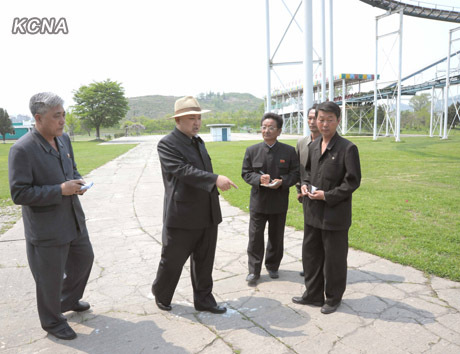 In its report on KJU’s visit, KCNA noted that he expressed his displeasure about the condition of the amusement park. 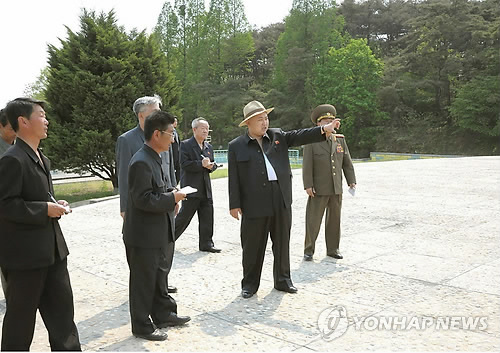 In undated images his visit, KJU is wearing a fedora of similar style to his grandfather, Kim Il Sung. Covering 70 hectares, the funfair has the first-phase funfair built in Kalmaeji Field and the second-phase one and a wading pool built on an expansion basis in Songsan Field. The funfair has made positive contribution to the entertainment of people and school youth and children for decades. He looked round various places of the funfair to acquaint himself in detail with its management and operation. In front of the swingboat in the second-phase funfair, he, pointing at the seriously broken pavement in the compound of the funfair, asked officials when the road was last re-paved. It is regretful that the road has not been managed well, he said. Putting his finger on the faulty arrangement of the bases of Oriental arborvitae and Sabina Chinensis, he said it would be good to have gravel stones planted in various shapes around the trees. Seeing the weeds grown in between pavement blocks in the compound of the funfair, he, with an irritated look, plucked them up one by one. He said in an excited tone that he has never thought that the funfair is under such a bad state and a proverb that the darkest place is under the candlestick fits the funfair. He scolded officials, saying why such things do not come in their sight and querying could the officials of the funfair work like this, had they had the attitude befitting master, affection for their work sites and conscience to serve the people. Plucking up weeds can be done easily with hands as it is different from updating facilities, he added. Saying that the amusement facilities have been put into operation with the paint scraped off, he noted that the officials and care-takers of the funfair have below-zero spirit of serving the people. This is not just a business issue but an issue concerning ideological viewpoint, he said in a serious tone. He dropped in at the fountain pool where he stressed the need to tidy up the place even though it may not go operational for this or that reason. Officials should draw a serious lesson from the tour of Mangyongdae Funfair, he said, adding that this occasion should be taken to issue a serious warning to the officials so that they can have proper spirit of serving the people. 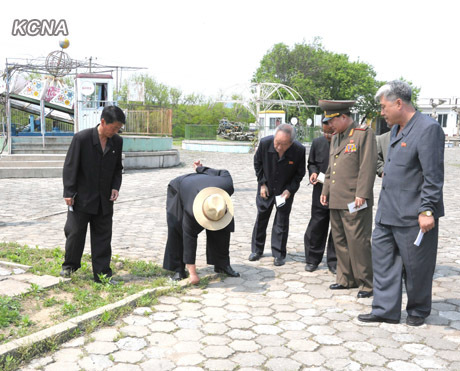 He called for sprucing up the Mangyongdae Funfair as required by the Songun era. This process should be made an occasion of removing outdated ideological point of view from the heads of officials and ending their old work-style, he added. He set forth the tasks for sprucing up the funfair. He gave Choe Ryong Hae, director of the General Political Bureau of the Korean People’s Army, the task for sprucing up the funfair as required by the new century by dispatching strong construction forces of the KPA. The officials of the relevant fields including the Pyongyang City Committee of the WPK, ministries and national institutions should fulfill their duties and responsibilities in sprucing up the funfair to implement the WPK’s intention of serving people in practice. He was accompanied by Choe Ryong Hae and Ma Won Chun, vice- department director of the WPK Central Committee. He waved back to their enthusiastic cheers, giving a warm encouragement to them. 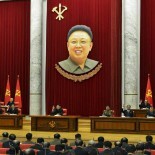 He expressed expectation and belief that all the service personnel and people including the participants in the meeting would carry out leader Kim Jong Il’s idea of land management and his last instructions without any slight deviation and concession so as to drastically change the appearance of the land to suit the features of a thriving socialist nation. He was accompanied by leading officials of party, state and military organs Choe Yong Rim, Kim Jong Gak, Jang Song Thaek, Kim Ki Nam, Ri Myong Su, Mun Kyong Dok, Ro Tu Chol, Ri Ryong Ha and chief secretaries of the provincial committees of the WPK. The meeting discussed the tasks and practical measures to turn the country into a land of bliss for the people by highly displaying the validity and vitality of the movement initiated and led by leader Kim Jong Il under the guidance of the dear respected Kim Jong Un. 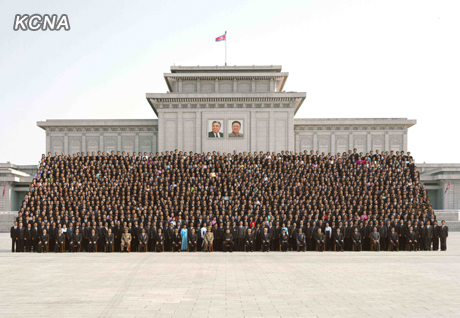 Present there were Choe Yong Rim, Kim Jong Gak, Kim Ki Nam, Ri Myong Su, Mun Kyong Dok and Ro Tu Chol, and officials of party and power organs, working people’s organizations, armed forces, economic institutions and the relevant field in Pyongyang and all provinces, cities and counties and activists of the movement. The participants of the meeting heard “On Effecting a Drastic Turn in Land Management to Meet the Requirements for Building a Thriving Socialist Nation,” the work of Kim Jong Un published on the occasion of the meeting. The work, published on April 27, 2012, said that President Kim Il Sung and Kim Jong Il paid deep attention to the land management and worked heart and soul to turn the country beautiful. It clearly indicates the tasks and ways for the officials and other working people in the field of land management to preserve and glorify the party’s idea and leadership feats performed in the land management and face-lift the appearance of the land to befit the land of a thriving socialist nation. 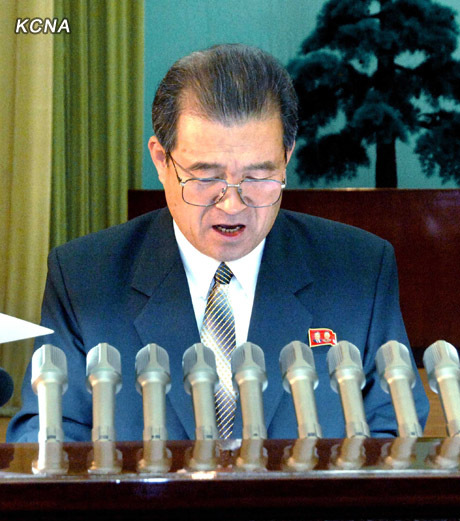 Kim In Sik, vice-premier of the DPRK Cabinet, in his report referred to the undying feats the peerlessly great persons performed in the work for improving the land construction and management. He also touched on the successes made in the land construction and management since the policy on general mobilization for land management was put forth. He underscored the need for all officials, party members and working people to dynamically wage a general offensive to successfully realize the far-reaching plan of the Party for land construction true to the leadership of Kim Jong Un and thus turn the country into a fairyland of socialism. Speeches were made at the meeting. 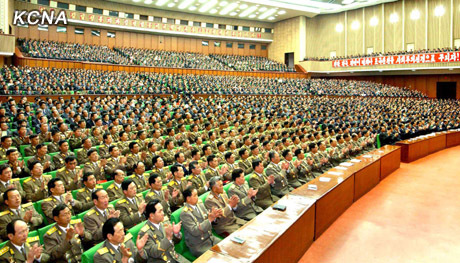 The speakers expressed their determination to fully uphold the work of Kim Jong Un as their important guidelines for land management and to dynamically step up the worthwhile effort forturning the country more beautiful in hearty response to the call “Forward for Final Victory!” made by the supreme commander of the Korean People’s Army to all the people of the country. 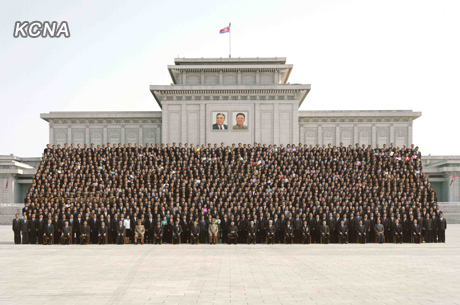 This entry was posted on 05/09/2012 by nkleadershipwatch in capital construction, Central Committee, Central Military Committee, Choe Ryong Hae, DPRK Cabinet, General Affairs, Guard Command, Kim Chong-un inspections, Kim Jong Un Visits, Kim Jong-un, KKH, Korean People's Army (KPA), Korean People's Army Supreme Command, Korean Workers' Party (KWP), KPA construction battalions, KPA construction brigades, KPA General Political Bureau, KPA General Political Department, KPA Supreme Command, land and enviroment, Ministry of Capital Construction, Ministry of Land and Environmental Protection, Ministry of State Security, Ministry of the People's Armed Forces (MPAF), MPAF GPB, National Defense Commission (NDC), North Korean press, party life, Political Bureau, Secretariat, State Security Department.